In an election year, public policy issues that are often ignored – such as free trade – can turn into an opportunity to appeal to the masses. Pennsylvania, a state that’s swung Democrat for the past six elections, is leaning Democrat once again – but not in the Scranton-Wilkes Barre area where Trump is leading by 16 points, according to The New York Times Upshot poll from October 27th. Trump’s protectionist platform has clearly helped him amass a following in Scranton, a city that has suffered disastrous manufacturing job losses. In a global sense, many academics say that free trade, and NAFTA in particular, has actually been beneficial – a view that is just the opposite of Trump’s rhetoric. The University of Chicago’s Booth School of Business, regularly conducts surveys regarding pertinent issues facing the global economy using leading economists from Harvard, MIT, Yale, Princeton and the University of Chicago. In March 2012, fifty-one of these leading economists that specialize in varying areas of the field were asked whether they agreed that US citizens, on average, are better off with NAFTA than without it. Some 90 percent of those asked responded and 85 percent of them said they agreed with the statement with the remaining five percent saying they were uncertain. None of the economists, however, disagreed. Commenting on this survey, Robert Seeley, professor of economics at Wilkes University, said that if people who have dedicated their lives to studying economics can generally agree on the topic of free trade, it should be commonly understood that trade is good overall. “I’m a Republican who will end up voting for the Democrat and I’m not at all thrilled with her,” Seeley said. The view from Scranton may be different. Scranton is one of the cities that has been hit hard by manufacturing job losses. According to the Bureau of Labor Statistics, manufacturing employment has been cut by approximately half in the Scranton-Wilkes-Hazleton metropolitan area. With a civilian labor force of 280,000, the fall from 51,000 manufacturing employees in 1990 to 27,000 in 2016 is enormous, although the decline had begun to level off in 2010. Even so, Robert Durkin, President of the Greater Scranton Chamber of Commerce, is confident the manufacturing sector will see an improvement. He cited the city’s work ethic and manufacturing history as the basis for his optimism. He said that Scranton has the right workforce for manufacturing companies and it also benefits from its proximity from New York, New Jersey, D.C., Boston and Harrisburg. The fact that major interstate highways converge here make its location prime for manufacturers. The Chamber has welcomed Select Tissue, a tissue, napkin and paper towel manufacturer, in March and Crystal Window and Door Systems in October. The two promise to bring in a few hundred jobs over the coming years for the Lackawanna County and are examples of domestic manufacturing that are doing well. But the Chamber’s efforts go beyond finding manufacturing jobs. The Community Revitalization Plan drawn up by the Chamber for the 2016-2020 timeframe plans to revamp the downtown Scranton area’s infrastructure, healthcare, technology and education sectors. Durkin believes the revitalization plan has created confidence, allowing people to “take the chance” to invest in the city. Currently, the highest employment numbers for Lackawanna county fall under the healthcare sector where there are three major acute care hospitals, a rehabilitation hospital and a new medical college that partnered with Geisinger Health System, one of the largest health service organizations in the United States. 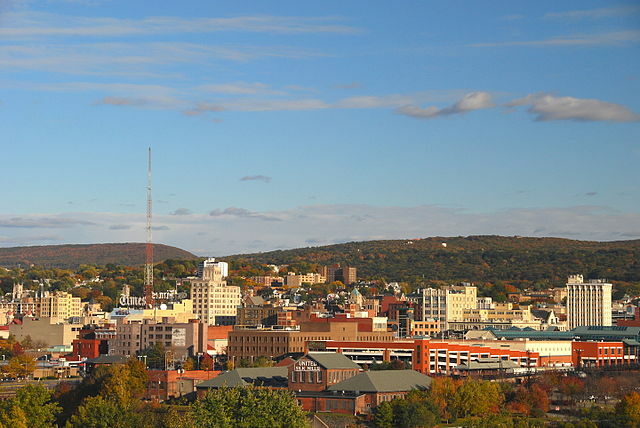 Bureau of Labor Statistics data shows education and health services employment in the Scranton-Wilkes Barre-Hazleton areas has risen from 37,200 in 1990 to 51,000 in 2016. Cory Crinella, a recent graduate of Marywood University, believes the city is “on the rebound.” Having lived here his whole life, he’s experienced the city’s downfalls but watching the new businesses and universities grow makes him feel that Scranton is on the right path. Not everyone is as optimistic, however. Melissa Ancewicz, a housekeeper at the Hilton, said Scranton was “not a good place to live.” Commenting on the Chamber’s efforts, she said the issue is not what they plan to do, but implementing those plans. She wants them to make the city safer rather than focus their efforts on painting street lights and fixing fire hydrants. “It’s a slow death,” is how Dominic Saadi, owner of City Café, described Scranton’s fortunes.In terms of the election, Saadi won’t vote for either Trump, who is “dangerous domestically” or Clinton, who he said was dangerous in her foreign policy. He said Scranton’s support for Trump stems from a “disenfranchised” white working class who are nostalgic for the city’s golden era decades ago. “It’s the way you look at religion – you just put your faith in him,” Saadi said.